Happy Spring! Although I wouldn’t know it since there are a few inches of snow out here in the Northeast. Nevertheless, Easter is on its way! I love greeting my guests with a holiday themed entrance because I think it gets them into the spirit of the holiday. When I think of Easter I think of Easter eggs so I wanted that to be the centerpiece of my look. I want to digress for a moment and give you a few suggested general money saving tips for holiday decorating. Check out the florist department in your local grocery because they have beautiful and inexpensive flowers. I love having flowers around the house because they are cheerful and smell nice but I don’t want to spend a lot of money on them since they only look fresh for about a week. I always buy my flowers from my local grocery store because they are beautiful and inexpensive. You don’t have to spend a fortune for fresh flowers. Now I will warn you that you will probably only find a limited selection of types of flowers, like roses, carnations, and seasonal flowers. So if you are looking for something special then this may not be a good option. You may even find assorted floral related goodies, like pots, branches, or plants. Shop for holiday decorations at the end of the season. 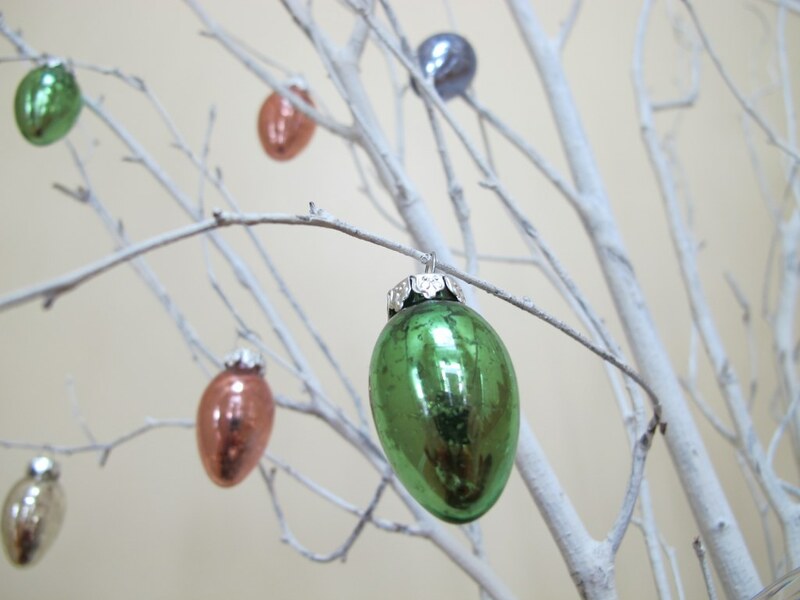 I tend to keep my holiday decor out for a short period of time so I don’t like to spend a lot of money on them. Stores don’t want to hold on to leftover seasonal items so you can find many good sales at the end of the season. In fact some stores will even have sales right before the holiday. I love a good sale! I’ll store whatever I buy until next year’s holiday. Undoubtedly the following year I’ve forgotten what I bought so it’s always fun seeing my new thrifty finds. Use artificial flowers around the house when it’s just you and update them with live flowers when you have guests. I’ll be honest, I am very picky about artificial flowers. If they look like plastic I won’t have them even if I’m the only one seeing them. I will splurge a little bit in order to get good quality artificial flowers but since I use them all year long I find it worth the investment. Ultimately I prefer live flowers but, I don’t have a weekly budget to buy them. Solution? Buy live flowers when it really counts, when you have guests. 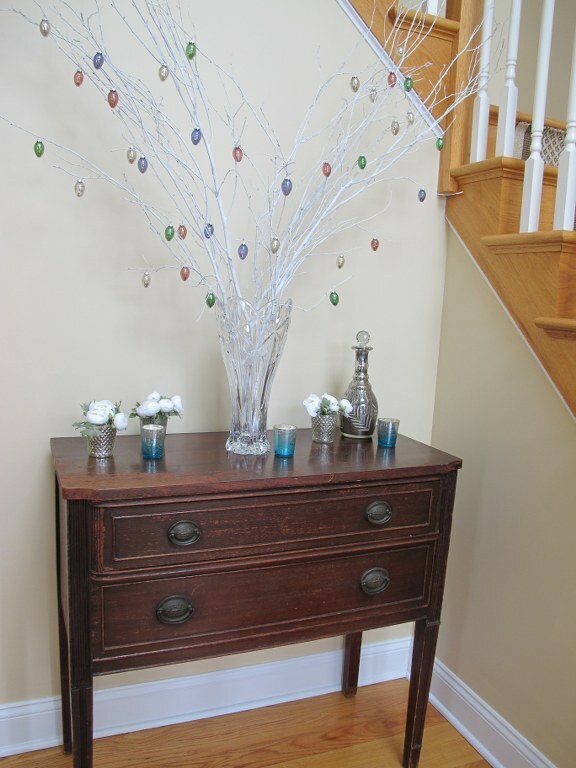 Now back to my lovely Easter foyer. Believe it or not, I purchased the white branches from my local grocery store at Christmas time for under $2 a branch! Who says I can only use them at Christmas time?! 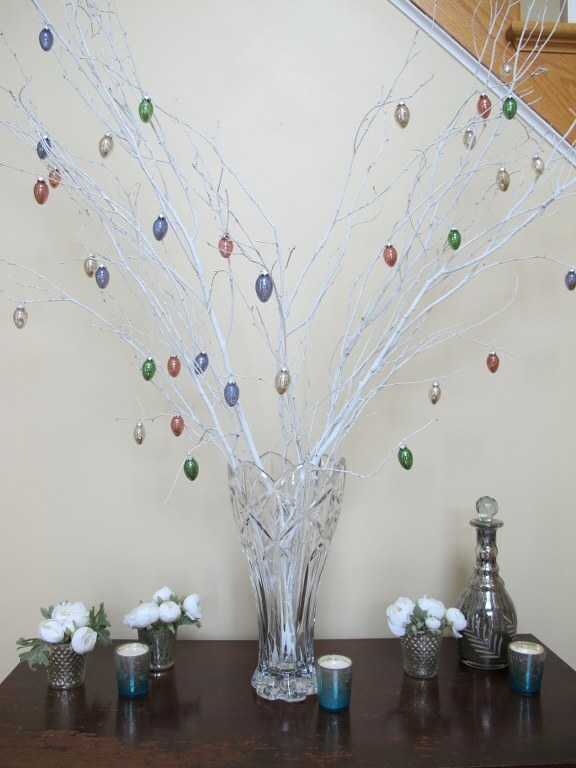 I added some mercury glass egg ornaments that I bought on sale last year and viola I have a simple and elegant Easter centerpiece. The centerpiece is a great statement piece and would look great on a dining room table by itself but I felt like the vignette needed something more for the foyer. 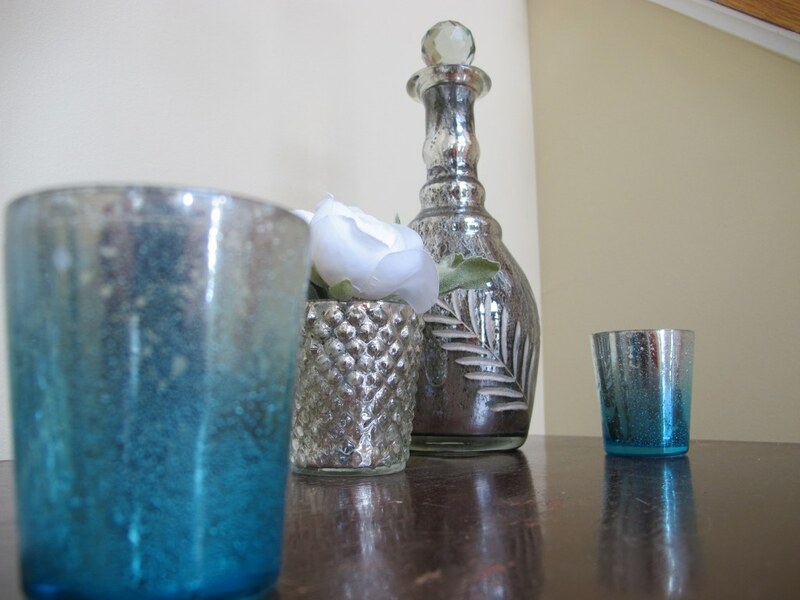 Mercury glass is so chic! It is an inexpensive decoration, it can be used all year long and can easily be incorporated with seasonal items, and it comes in a variety of shades and types to coordinate with your style. I’ve even seen that you can make your own mercury glass item but I haven’t experimented with that yet. Have you? To pick up on the mercury glass detail of the egg ornaments in the centerpiece, I added a decanter with a dark mercury glass pattern, three textured mercury glass containers, and three blue mercury glass votives. I added little artificial white flowers to the small textured containers and I’d update them with live flowers when I have guests. The three blue votives came with candles in them but once they’ve burned I’ll insert tea lights. The mercury glass shimmers beautifully at night when the candles are lit. I must have switched up this vignette no less than 10 time using other pieces. Have I mentioned that I’m a perfectionist? But I’m finally happy with this perfect Easter setting.